Home / Articles / Islamic Issues / Muslims will dominate, but will Islam prevail? Muslims will dominate, but will Islam prevail? The latest research shows that the number of Muslims will equal the number of Christians by 2050. What’s more, Muslims will outnumber Christians worldwide around 2070. That’s if we are to believe the Pew Research Center, a think tank focusing on religion that has done a thorough study of religion-based population growth worldwide. According to the study, by 2050 the number of Muslims around the world (2.8 billion, or 30% of the population) will nearly equal the number of Christians (2.9 billion, or 31%), possibly for the first time in history. And if current trends continue, Muslims will outnumber Christians worldwide around 2070. The study would have us believe that Muslims will be the dominant religious group in the world in another 50 years or so. Islam’s going to be the dominant faith, and it’s not a very long time away! That’s news! But is it really good news? As a Muslim, I should be happy to see Islam being the dominant faith, why not? But I have my reservations as well, because numbers don’t really mean a thing if we don’t have the faith, goodwill and intelligence to go with it. One has only to look at the Muslim world today to understand the predicament we are in. 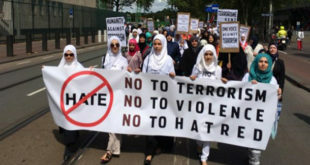 Muslim fighting Muslim, Oppression of protected minorities, Suppression of women, and all in the name of Islam, which in the first place condemns all such vile acts. The problem, then, is not with Islam, it is with Muslims! In such a context, is it really a good thing to have such a large Muslim population after all? Is it a good thing to have people professing to be Muslim perpetrating acts of terror like what ISIS is doing, or oppressing women like the Saudis are doing or suppressing minorities with harsh blasphemy laws like the Pakistanis are doing? If the world is going to be dominated by the likes of these, I’d rather pray Islam remains confined to a few good people! But on second thoughts, we cannot hide from reality or run away from it. To save Islam, we have to purge it of the rot misguided Muslims have caused it. I thought it over and came up with a Seven Point Plan for a radical social transformation of the Muslim world. It might seem harsh, but it’s the best option I can think of to redeem the good name of Islam and save the world from the scourge of misguided misfits who kill in the name of religion. Believe it or not, good religious teachers are few and far between. Ever heard a preacher saying how our beloved Prophet welcomed Christians to his mosque in Medina and allowed them to pray there, or how he let women visit mosques and even shortened his sermon because he heard an infant crying so as to not inconvenience its mother. Chances are you haven’t. As such it’s imperative to breed a new generation of preachers who understand Islam in its true spirit, who can win the hearts and minds of people including those of other faiths by just talking to them. By the way, ever heard a Christian pastor speak? Visit a church and listen to him, he’s following our Prophet to the word, speaking the language of mercy and humility, so soft and soothing and so very pleasing to the ear. This is exactly what we should look for in our preachers. But why look to the pastor when our beloved Prophet showed us the way! Misguided preachers are a dime a dozen. There are so many of them, it’s difficult to count them. One might as well count the stars in the sky. One has only to go to our Friday sermons to realize this. Most preachers are only good at ranting and raving against other faiths or busy commenting about how scantily clad women are nowadays, talking about the mundane, rather than the really spiritual aspects of Islam. So just as we need to promote good preachers, we need to eliminate the bad ones, brainless scum who spew their venom on each and everyone as if only they are going to heaven. One can only hope the day is not far off when the congregation takes it upon itself to take hold of these low IQ retards by the collar and cast them out from the pulpit. Till then, the state must ensure that such preachers don’t have a say in the first place. Monitor them and if they step the bounds prohibit them from giving sermons. What greater remedy for a habitually barking dog than to muzzle it? It’s simple as that! Bad preachers are of course the product of bad madrasas, usually half-baked ones that think that teaching students to simply recite the Quran or that women should go out fully covering their faces is all they need to know about Islam. I have on more than one occasion interviewed the products of these seminaries to find one suitable for outreach work for an organization I serve, only to have them say that they believed the niqab or face veil is compulsory for women, despite so much evidence in both the Qur’an and hadith literature to the contrary. Yes, the fact is that our madrasas have become breeding grounds for extremism. As such there must be a radical solution to control it. It is only the strong arm of state authority that can do this. How can one expect the religious authority to do this when they themselves are largely the products of such madrasas? The state must not only supervise the teachers but also draft a new set of curricula incorporating all positive teachings of Islam and eliminating sectarian and misogynist interpretations. Yes, sad to say, this is another grave problem we in the Muslim world face. Parents are only too happy to put their weak-minded offspring into these madrasas which don’t require much intelligence. Their bright ones they induce to go out to the world and make it big in lucrative, well paying jobs. This is the kind of shabby treatment we give our faith. Why not put our best minds to the madrasas, like the Christians do theirs. Did you know that the churches, both Catholic and Protestant admit only their best minds, while we persist in putting our worst to these sacred institutions. Is this the kind of respect we show God? Little wonder we Muslims are paying the price for this! So here again we need radical transformation. Bring in strict rules to admit madrasa students. I am not saying to confine it to those who have done higher studies, since there are many bright minds out there who may have not had the chance to benefit from it, but at give them a rigorous IQ before taking them in. The weak minds already there should be put to work in some form of vocational training where they could serve society and not bring a bad name to our noble faith. Although this might seem a bit difficult, it can be done. A Pew Survey done some months ago found that some Muslim populations had extremely harsh views on women that bordered on the hypocritical. In Jordan for instance it was found that as much as 81 percent of respondents were of the view that honour killing was never justified when men committed the offence, while only 34 percent said it was never justified when women committed the offence. This of course goes against Islamic teachings that in the first place doesn’t condone honour killings and certainly doesn’t say women should be treated any different from men with regard to punishment. So what do we do with those who harbour such double standards? On first thought, I’d think why not cull the entire lot, but Islam prohibits us from exterminating people just because they hold such views. So what do we do with these hypocrites? Simple, keep a tab on them and tighten the screws, continually harass them and psychologically wreck them. Such people are better off locked away in a madhouse than let loose upon society to give our faith a bad image. This is another thing we really need to think over. This stress on ritual to a point where we think less of doing good to our fellow creatures and more on ritual to the point of squabbling over whether we should shake our fingers in prayer or sit or stand while drinking water. This is where the Jews went wrong, stressing so much on ritual that they forgot the finer aspects of faith, which is precisely why Jesus was sent to reform them. Whenever the Qur’an tells us about the wrongdoings of the Jews, it’s also telling us something, to learn from their mistakes so that we don’t become like them. But sad to say, many Muslims who strut the world today have indeed become like them, not as much as caring to look the way of a poor wretch in rags looking for a penny to feed his family, but spending hundreds of thousands to perform the Hajj every year in the belief that it would wipe off all their sins, and on top of that return to their homeland to get on with their same old wicked ways, little realising that the very reason God has given them the opportunity to come back sinless as a newborn babe after performing it, is to give ample scope for repentance and a resolution to reform oneself and from that point lead better lives as decent people. Nay, they make a travesty of our faith and should be told as such. I for one have no qualms about letting such people know what I think about them. Make them feel ashamed of themselves. Let it prick their conscience! Yes, sorry to say, many Muslims today are highly inbred which contributes to low IQ and narrow minds. Cousin marriage for instance is rampant in the Arab world, especially in countries like Saudi Arabia. In such societies, it is the preferred form of marriage, consolidating kinship ties and keeping wealth in the family. But little do these bumpkins stop to think of the harm it does them. Consanguineous marriages increase the risk of birth defects and mental retardation, which is very common in Saudi Arabia. In fact, Saudi Arabia has the highest incidence of genetic disorders in the entire world. Not surprising given that to this day almost 50 percent of married couples are closely related, usually first cousins. Take a look at your typical Saudi and you can see how inbred they are, it even shows in their faces, a far cry from the days of our beloved Prophet and the few centuries afterwards when they were such a noble, beautiful and intelligent people. Just as much as we need to avoid cousin marriage, there is also a need to marry out and widen our gene pool. Research shows that the offspring of different races are much more robust and intelligent, inheriting the virtues of both parents and the vices of none. This is a well known principle in genetics known as hybrid vigour. In fact the flowering of early Islamic civilization was probably due to such intermarriages between Arab, Persian and Byzantine when this beautiful blending of races was seen in its full vigour, when Muslims led the world in all areas of science from medicine to mathematics to military science. A new blending of races could – God Willing – lead to a second flowering of Islamic civilization with Muslims leading the world in innovative ideas and taking it to new heights in areas such as eco-friendly developments to earn the goodwill of all and sundry. There’s nothing unislamic about marrying someone from another race so long as you’re sure to bring up your offspring properly. After all, wasn’t it Prophet Abraham himself who took as his spouse the Egyptian lady Hagar, a precedent followed by our beloved Prophet himself when he espoused Mariya the Copt, a beautiful Christian lady from Egypt. To sum up, it’s high time we Muslims seriously thought of our place in the world and the role we ought to play in taking it forward – to win hearts and minds and contribute meaningfully to the world like our forebears did. Mess it up and we’ll have hell to pay! Singing & Music in Islam – Halal, Haram or Middle Ground? Asiff Hussein | Designed by Merge Holdings (Pvt) Ltd.